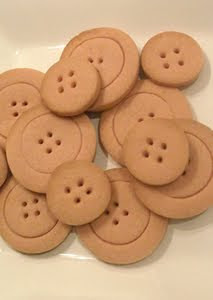 Due to my current minor obsession with button shaped things, I made some button biscuits! I must admit that I was rather inspired by a post at Forty-sixth at Grace. Her un-baked cookies look so lovely in pastel colours. Mine are not such a pretty shade but tasted pretty good. Not too sweet (a nice change after the fudge incident) more like a shortbread biscuit. I had to add some extra flour as the mixture was a little sticky and it really does help if you refrigerate it for the times suggested. I am very impatient and tend to stick things in the freezer for 5 minutes and hope for the best. I used a skewer to do the holes in the middle. Even the recipe is cute! It can be downloaded via Forty-sixth at Grace as a beautifully illustrated page by Eva Juiliet. Aah, this is so cute! It looks such a simple idea can't believe I have never seen it before. Oh those are adorable! I may have to try those myself! If you do give them a go, the recipe makes a lot of biscuits! The collection in the picture is made from 1/4 of the amount. These are so cute! I thought they were real buttons from the thumbnail in my feed. These are so cute. In fact your whole blog is fab. Glad I found it.